When a small town kid makes good, everyone in the village – who after all, raised that child – is supposed to feel proud. That has to be why New Zealanders fetishise the success of the All Blacks, regard Lorde’s international success as a personal triumph and treat the news of say, some Kiwi bloke coming sixth in a cycle race somewhere as a topic of abiding national news interest. But even so… should the Government Communications Security Bureau (GCSB) have used its ample spying resources to further the personal ambitions of former Trade Minister Tim Groser to head the World Trade Organisation? Surely, that’s pushing it. Did we all have such a stake in raising little Timmy G and seeing him through his formative years that we’re expected to share the joy of his career advancement on the world stage? Do we all win when some National Party apparatchik gets a real job? This week, the watchdog of our security services – SIS Inspector-General Cheryl Gwynn – found that there was nothing unlawful in the fact that the GCSB chose to throw its resources behind Groser’s WTO bid, which BTW, failed comprehensively. Gwynn declined to say whether this was an appropriate use of those resources. But she did say that the spy agency’s “robust but informal” internal procedures were not followed. It also seems that even the best gear at the GCSB’s disposal couldn’t detect much affection for Groser within global trade circles. Groser’s behaviour during the TPP talks – when he seems to have angered and perplexed his Japanese counterpart – may help to explain why his WTO bid hit the rocks. New Zealand changed its bargaining strategy at a ministerial meeting in Atlanta on the evening of Oct. 2 as Groser said Wellington would accept the U.S. proposal for pharmaceutical data and the start of deliberations on dairy products after those on drugs. Other negotiators were puzzled by the sudden change in New Zealand’s stance… In disregard of concern on the Japanese side, Groser watched a Rugby World Cup game on television in a bar in Atlanta on Oct. 3 with Malcolm Bailey, 57, chairman of the New Zealand Dairy Companies Association, and other people. Australia, New Zealand’s partner in the negotiations, beat England in the match. This was the second consecutive day that Groser watched the rugby tournament. This diplomatic genius is now our man in Washington, where his tasks include building bridges to the Trump administration. Lets hope the GCSB can turn him up something comparable to whatever it is that Vladimir Putin has on Trump. In German “Tod” means death, which is a fair indicator of the flatlining career prospects of the current MP for Clutha-Southland. Not cooperating with the Police over the circumstances of his secretive recording of the workers in his electorate office was bad enough. 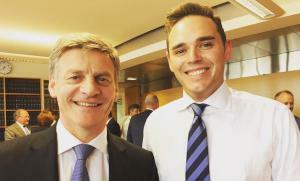 Yet until yesterday Todd Barclay seemed to have gotten away with this stonewalling tactic, hitherto the last resort of dodgy US suspects invoking the Fifth Amendment against self –incrimination. Regardless, Barclay won re-selection last year from his newly minted local team, and from an apparent head office decision that it was less risky to keep Barclay inside the tent than have him seeking retribution from outside it. Surely, if everyone kept their mouths shut, a lid could be kept on this business. Yesterday though, the Party’s cover-up came back to haunt Barclay – who not only (a) contradicted his boss and electorate predecessor Bill English, but (b) impelled English to execute an embarrassing 180 degree turn in the afternoon from the memory lapses he’d hidden behind when talking to reporters in the morning. For more than a year it now seems that English was complicit in hiding the potentially criminal behaviour of one of his MPs, from the public. Among the many unsavoury aspects of this affair is that Barclay’s behaviour in secretly taping his staff left the taxpayer with a bigger payout to sacked Clutha-Southland electorate official Glenys Dickson than would otherwise have been the case. As emails sent by English last year to then Clutha-Southland electorate chairman Stuart Davie reveal, the secret payout had been inflated by the privacy breach caused by Barclay’s taping adventure, and by National’s desire to shut down any further legal action on Dickson’s part. This sweetened payout was partly met from the leader’s fund available to the then-PM, John Key, on the rationale that since Dickson was an employee of Parliamentary Services, the diversion of funds was appropriate. This was not the first time the lines have been blurred over the use of the leader’s fund – which taxpayers surely never intended to be used as a handy trough to enable the National Party to bail out of jams of its own making. The leader’s fund was also used to help meet the costs sought by camera operator Bradley Ambrose in the wake of the Epsom Teacup Taping Fiasco. The party of personal responsibility seems rather averse to shouldering it, itself. All of which is quite incredible – given how loudly and righteously National complained when the Clark government tapped into the leader’s fund to help finance its pledge card. At this rate, New Zealand has little reason to point the finger at Donald Trump whenever he uses the powers of his office for personal advantage. Footnote : Barclay’s brief ‘apology’ statement last night was essentially an attempt to get his story and the Prime Minister’s current version of events back in sync. It was inadequate. Of course, English could order Barclay to cease refusing to co-operate with the Police, or face de-selection. The Police, for their part, seem to be unduly sensitive to the way the political wind is blowing. Currently the Police are showing no interest in acting on the PM’s admission that Barclay secretly (and on the face of it, criminally) taped his staff. In the circumstances, the Police should be feeling obliged to re-open the investigation, if only to re-assure the public of their independence. Let Barclay be seen to try and stonewall in court. Surely, even if in court, Barclay tried to argue that the taping had been accidental – eg that he left his Dictaphone on by accident and therefore lacked intent –such a defence wouldn’t wash if he had then gone on to intentionally use the tape contents against Dickson. Right now, the government seems to be in full ‘possum in the headlights’ mode on this scandal. This song seems highly appropriate.